The word Reiki can be translated from the Japanese to mean ‘Spiritual Energy’. The word refers to energy rather than a system or teachings. A Reiki Practitioner who studies the system of Reiki is taught methods that were developed by the founder Mikao Usui in the early 1900s that utilize ‘Reiki’ to heal the self and become whole. 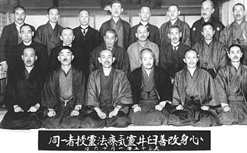 Influences upon Mikao Usui (1865-1926), and consequently upon his teachings (which are known as the system of Reiki today), came from his Japanese martial arts practice, Shintoism (the traditional Japanese folk religion), Japanese Buddhism (namely Tendai), and Shugendo (a spiritual mountain practice). Naturally the Japanese culture and philosophy that was apparent during Mikao Usui’s lifetime was also a great influence upon what has developed as the system of Reiki. Reiki, the word, is Japanese. It is written with two Japanese kanji, meaning ‘Spiritual Energy’. Previously these two kanji have been translated as ‘Universal Energy’ (or Universal Life Force Energy) outside of Japan. This is a translation of the second kanji, ‘ki’, only. The concept of ki is naturally the energy of everything including Heaven and Earth, the entire universe. The first kanji, ‘rei’, may have been left out of English translations due to the fact that the term ‘spiritual’ was not the focus of the modern practise. In Chinese, the same two kanji used to represent Reiki are pronounced differently but have similar meaning. In Chinese, Reiki is called Ling chi. The word ‘Reiki’ is also used today to represent a healing system. Mikao Usui, the founder of the system of Reiki, did not call his teachings by this name. ‘Reiki’ appeared written in conjunction with his teachings but this was merely to point out that the teachings worked with spiritual energy. ‘Reiki’, the word, can be found in the branches of schools that developed from Usui Mikao’s teachings. Both the Usui Reiki Ryoho Gakkai (Society of the Usui Spiritual Energy Healing method) and Hayashi Reiki Kenkyu Kai (Hayashi’s Spiritual Energy Research Society) use the word ‘Reiki’ to signify ‘spiritual energy’, but neither actually called the system ‘Reiki’. Hawayo Takata was the first student of these teachings outside of Japan. Hayashi Churjiro, her teacher, came with her to Hawaii to help her set up her practice. At his farewell dinner in 1938, he presentation her with a Western-style certificate. This official gesture ensured that she was viewed as a legal teacher and practitioner in these teaching under American law. The certificate states in English that Hawayo Takata ‘has passed all the tests and proved worthy and capable of administering the treatment and of conferring the power of Reiki on others’. This appears to refer to the word Reiki as meaning ‘spiritual energy’ rather than the name of a system. The certificate also states in English that she was a ‘Master of the Usui Reiki system of drugless healing’. Here the work ‘system’ appears to have been translated from the Japanese word ‘Ryoho’ while the word ‘Reiki’ has been left as is. In neither instance does the certificate convey that the system was called ‘Reiki’ by Hayashi Churjiro. The downside to using ‘Reiki’ to mean a system is that people can become confused about what particular practises fall under that name. All the systems names ‘Reiki’ today claim to use spiritual energy in their practise, yet how they work with energy can vary enormously. Since there is no standardised ‘Reiki’ healing method, we have chosen to define what we are expressing by using the term ‘system of Reiki’ when talking about the particular teachings we practise. Shoden teaches how to practise healing the self and the basics about helping others. At this level the student is heading out on the path to self-discovery, this is just the beginning. Okuden is where students learn three mantras and three symbols that aid in focusing the energy. At this level you discover your hidden inner qualities such as your Earth, Heaven and Heart energy. There is the opportunity to develop a professional treatment practice from these teachings. Shinpiden focuses on personal development and teaches the student how to perform attunements. At this level you move into discovering more about the mysteries of life. How you relate to yourself and the universe. This can be practised for the rest of your life and is always a personal practise which can develop into a professional teaching practice if you so desire. There are also deeper Japanese cultural and philosophical understandings that are taught at each level, which will be explained in more details with the appropriate levels. This occurs through working with the precepts, and, traditionally, poetry which was written by the Meiji Emperor. These traditional practices are taught throughout all three levels. This is the physical aspect which can be used on the self or others for the purpose of healing. Four mantras and symbols. Three in Level II and one in Level III. These are received during a Reiki course (and at follow-up practise groups) and taught at the Shinpiden level. experienced energetically. Reiki is a lifetime practise, so there should be no hurry to move to the next level. For each individual there will be an appropriate time to move on to a new level. Once a student has completed Shoden, it will take time to practise what has been learned, and to adjust to the new level of energy in the body, before moving on to the next level of teaching. Largely, it will depend upon a student’s home situation and the availability of time to practise. A mother with a full-time job and numerous hobbies may have little time to practise. A traveler who has taken 12 months off may have ‘all the time in the world’.